Do as much or as little as you like. Stroll magnificent beaches, collect shells on rocky headlands, swim & surf in clear waters, play golf on local course, play tennis on court down road (we supply rackets & balls),waterski & sail on Swan Lake, canoe on Berrara Creek, bike ride or bush walk in adjoining state forests - OR - lay back on one of our deck lounges & read with a glass of wine - OR - do absolutely nothing & watch the ocean - relax & restore the batteries. Sussex Inlet is 30 minutes south of Nowra. 2 & 1/2 hour drive from Sydney. After Sutherland an easy drive mainly on freeway. Cudmirrah / Berrara are at the end of a peninsula surrounded by ocean & state forests; there is no through traffic. 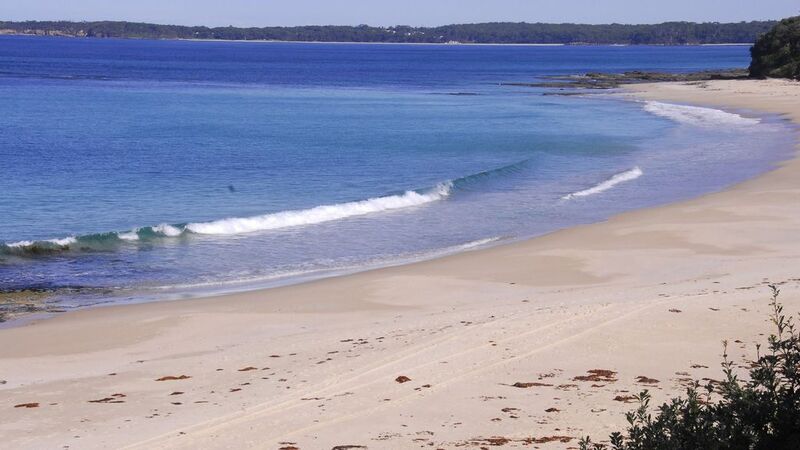 Cudmirrah Beach can be accessed by track directly in front of house or by stairs 50 metres from house. Beautiful ocean views from lounge area, kitchen and verandah. Watch the dolphins and migrating wales at certain times of the year. The ocean rock pools are directly in front of house. Conneely's Reef is very popular with surfers. Wonderful place, clean, close to beach and town can’t ask for more! Thank you to Erica and Bob your place is just perfect. Appreciate the great service and information provided by you. Will definitely book again! Watching waves is a well equiped and a very cosy holiday home with no houses in front of you, only bush and ocean. Nothing better than sitting on the balcony eating dinner watching the sun go down and listening to the waves. We had an a amazing 3 days of R&R. It is a short distance to the beach by either by going down the a track or the stairs. We did both but the stairs were easier for us. We had a 2 and 4 year old with us and the beach was perfect for them. The rock pools and shelf were easy to get around and kept them busy. There is a park within a 2 minutes walk at the end of the reserve. Would have liked a double bed in the other bedroom maybe a bunk bed with a double bed under it. Erica and Bob have put alot of thought and love in this holiday home. We will definitely be back. Will take your suggestion of bed layout in 2nd bedroom on board. Good idea. Watching Waves is in such a pristine location right next to the beach. The house itself was very well presented an catered for all of our needs for our stay. All of us had a really relaxing time and we will be back! Absolutely fantastic place. So clean, amazing views, even the whales put on a show. Close to everything we needed. Very peaceful and relaxing and the owners are s pleasure to deal with. THANKYOU!!!!! Will definitly be staying again!!! Watching Waves is by far one of the cleanest and well equipped places we have stayed. There is plenty of storage area in the laundry downstairs for gear and the extra toilet/shower are handy for after a day at the beach. The beach access path directly behind the house is great but may be an issue for anyone with mobility issues being a little steep and muddy. There are stairs not far up to easily access the beach near the lookout. Unfortunately recent weather made the grassy reserve soaked through and muddy so we couldn't play games but we had a great time at the beach seeing the dolphins and fish. Thank you Erica for sharing your fantastic property with us. We hope to return again. Thank you for your accurate and truthful report. Weather ,particularly rain ,does make the reserve quite soggy, but that is out of my control. You were lucky to see the dolphins , sometimes we even see migrating whales . Hope you can make it to stay at a drier time of the year next time. We really enjoyed our time here. We will definitely be back!